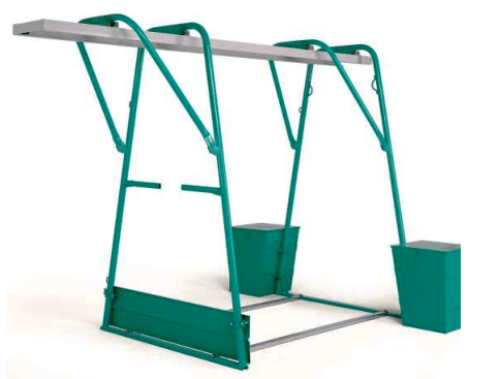 The ET 300 has lifting capacities up to 300kg, no scaffolding required. 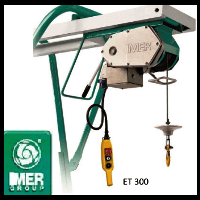 Perfect for all types of construction sites, the Imer ET300 gantry hoist perfectly complements the Imer gantry frame. 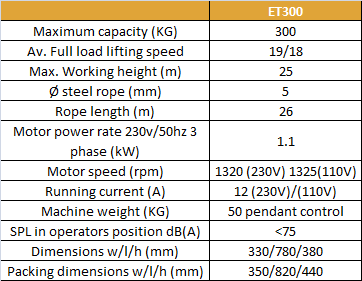 The ET 300 hoist needs to be attached to the gantry frame in order to be used. Making light work of over-edge lifting this Imer gantry system is capable of lifting loads of up to 300kg. The frame ballast boxes must be filled correctly with suitable materials. Always refer to manufacturers instructions. Once the target weight is reached the full ballast boxes will form a counterbalance. 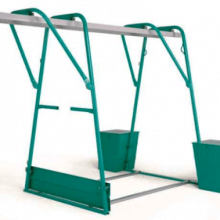 This will add good stability to the gantry, hoist and load. You should always know the weight of the load when using a gantry hoist. Guessing is simply not good enough! Any load over the safe working load limit is dangerous. The whole system could topple over, with severe consequences. Lifting Hoists Direct can supply the hoist, gantry and ballast boxes, all available separately, along with numerous other accessories. 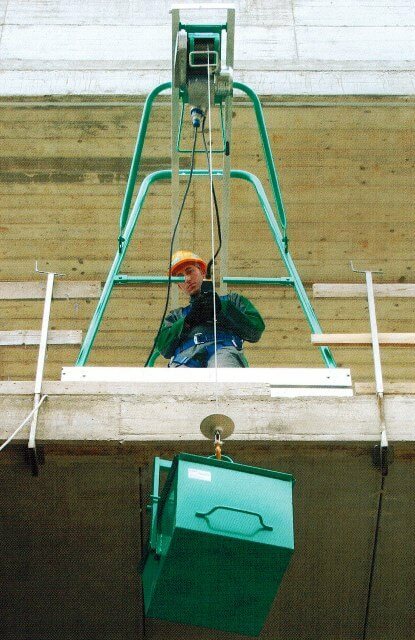 This gantry hoist incorporates a self braking motor with a patented brake rectifier with magnetic device and an upper limit switch for safety. Other features include a positioning brake. 4 aluminium wheels within its frame for easy manoeuvring on the gantry framework. Direct controls which have 3 push-buttons for various functions and a 1.5 metre control cable length. With an IP67 rated plug and a single phase 230v/50Hz motor incorporating helically toothed gears in a permanent oil bath, you can be assured of a reliable and durable lifting device. The drum on which the wire rope is wound consists of an anti rewinding system or ‘ARS’ which eliminates the risk of the rope winding onto the drum the wrong way.